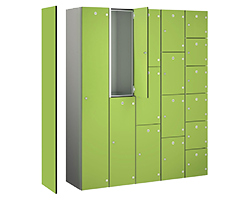 This range of stunning steel lockers from Lion / Probe exudes class. Perfect for a wide range of environments - especially where aesthetics are important. These attractive lockers are enhanced by a 18mm MDF core gloss laminate door from stock colours - Gloss White, Gloss Snow White, Pale Slate and Marmara Blue. Other bold colours are available for orders of locker with 15 doors in total or more - Lime Grass, Orange, Dark Sevilla Olive, Viola, Pencil Line Light, Pencil Line Dark and Chilli Red. In addition to these colours, hundreds of other laminate colours are available - please call us on -1772 322634 for details. The locker body / carcass is available in white, black or silver. Optional matching gloss end panels are available to give your office, gym, health club or workplace the finishing touch. These lockers comply with BS4680:1996. These lockers have been treated with ActiveCoat - the anti bacterial technology exclusive to Probe - providing 99.9% reduction in bacteria including MRSA and E-Coli for the life of the coating resulting in a safer, hygienic environment for clients and employees. The 1 Compartment lockers are fitted with cam locks and 2 keys per door as standard. Other lock options are available including padlock fitiings (padlock not supplied), combination locks and digital combination locks. View Other One Door Lockers.